The deployment of mixed reality environments for use by members of the public poses very different challenges to those faced during focused lab studies and in defined engineering settings. This chapter discusses and presents examples from a set of case studies that have implemented and evaluated fully functioning mixed reality environments in three different organisational settings. Based on these case studies, common themes that are critical in the engineering of publicly deployed mixed reality are drawn out. 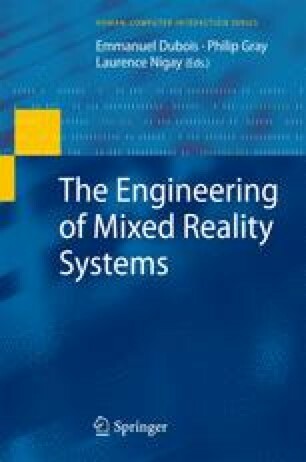 Specifically, it is argued how the creation of a mixed reality interaction space depends on the technology as well as the environment, how asymmetric access provided to different sets of participants can be desirable and how social interaction reflects the particulars of the embedded technology, the length of deployment and the existing social organisation. We thank the EPSRC for their support of the case studies through the EQUATOR IRC [GR-N-15986]. This research is also supported by the Leverhulme Trust.